The Festival Hall was located in the South Gardens amidst gardens, fountains, pools, and paths. The hall’s main auditorium was home to the 7,000-pipe, 40-ton Exposition Organ, the most advanced pipe organ in the world, which was built especially for the fair. There were a total of 368 organ recitals during the nine months of the fair. 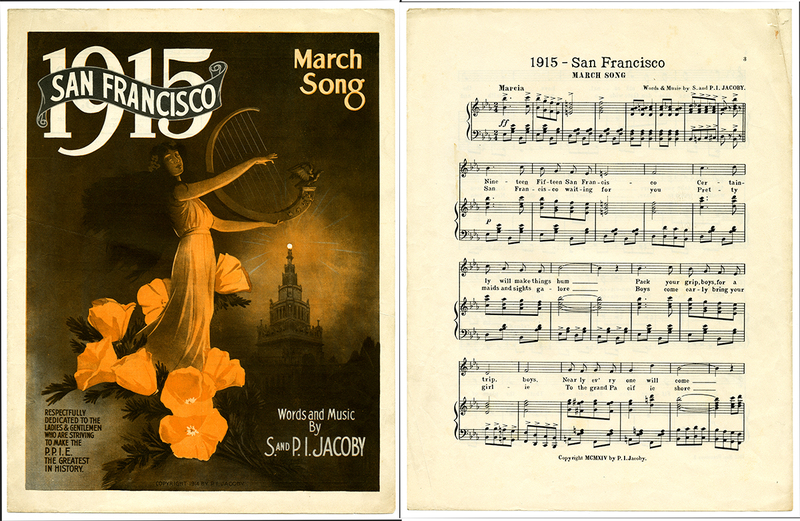 There were no all-female bands or orchestras in the Department of Music’s official programming, but some women musicians, such as harpists or violinists, played for specific events. Women pianists were the exception. One, Olga Steeb, was said to have committed 10,000 pages of music to memory! Women did not officially become members of an orchestra until 1924. Among the fair’s highlights was Hawaiian ukulele music. It became the fair’s—and the nation’s—biggest musical craze. Its most popular location at the fair was the Hawaiian Pavilion, where a Hawaiian quintet played for as many as 34,000 people a day. Bands were one of the many musical groups that presented live music at the fair. There were more than 2,000 musical performances by professionals and amateurs, internationals and locals, teachers and students. This march, composed for voice and piano, was “Respectfully dedicated to the Ladies & Gentlemen who are striving to make the P.P.I.E. the greatest in history.” Written before the fair opened, it won a prize in the San Francisco Bulletin’s Exposition Song Contest. Native Americans and indigenous people from several American territories lived on the Joy Zone in “ethnic villages,” a standard feature of world’s fairs. In cultural demonstrations Maori, Samoan, and Somali people danced and performed rituals, and went about their everyday lives as visitors looked on. Some Anglo-Americans thought that their own ways of life were superior to nonwhite cultures, but others were more respectful of cultural differences. American-born dancer La Loïe Fuller was one of the most famous dancers of her time, known for her blend of light, music, and movement and her original theatrical lighting and stage design. In this photograph, her company performs a “dance spectacle” in flowing costumes on Fine Arts Preservation Day, October 16, 2015. Through the arts, we learn about different cultures as well as our own. At the fair, many local girls in costume performed dances from foreign lands. The California Historical Society’s exhibition on the Panama-Pacific International Exposition and the performing arts at the fair is open to ticketholders of the San Francisco Ballet Nutcracker, December 16–31, 2015, at the War Memorial Opera House. CHS’s exhibition about the Panama-Pacific International Exposition—City Rising: San Francisco and the 1915 World’s Fair—is open until January 3, 2016 at CHS headquarters, 678 Mission Street, San Francisco, and until January 10, 2016, at the Palace of Fine Arts. City Rising: San Francisco and the 1915 World’s Fair is part of San Francisco’s Centennial Celebration of the Panama-Pacific International Exposition (PPIE100), presented by AT&T. CHS is an organizing partner of the PPIE100 along with Innovation Hangar, the Maybeck Foundation, and the San Francisco Recreation & Parks Department.